If you’re looking for new furniture for you’re RV, you’ve probably realized by now that the brick-and-mortar stores are few and far between. But there are plenty that will ship to your home, which is great because you have more choices that way! 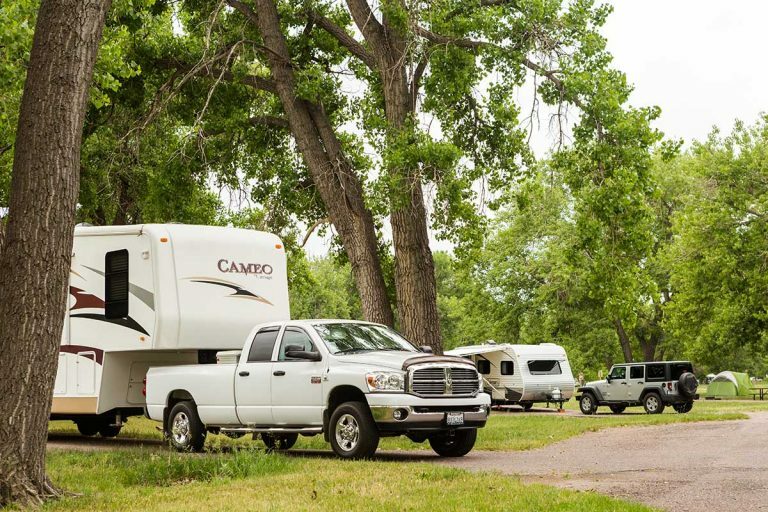 I scoured the internet; here’s an extensive list of all the places to buy RV furniture. As with many things, Amazon has a wide variety of choices in RV furniture. They carry a lot of the major brands, with many items coming with free shipping (and some even with Prime shipping). Amazon’s selection of RV furniture includes sofas, recliners, mattresses (including RV-sized choices), tables, and more. 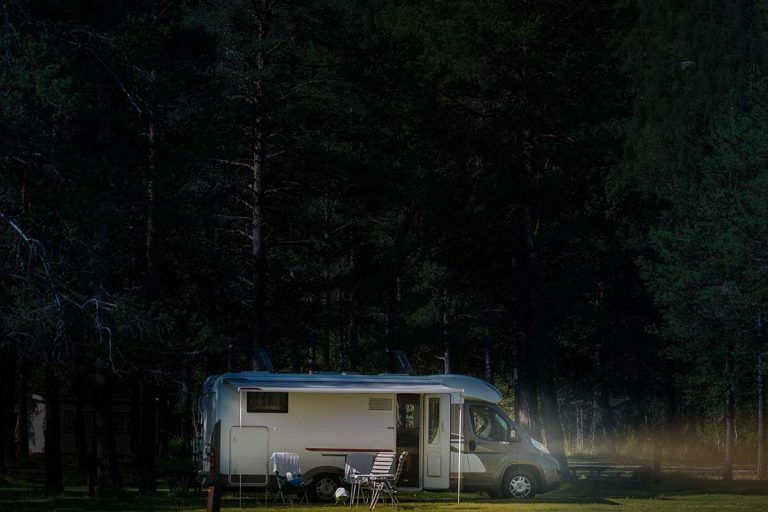 They also have all types of parts and accessories, as well as camping/outdoor furniture. As the name implies, this nationwide chain has all things RV-related, including the RVs themselves. If you don’t have one near you, they will ship to you from their online store. Like Amazon, they have both indoor and outdoor furniture, and also furniture for boats (that may or may not work for your RV). Also, for an in-store option, they can help you with the removal and installation of the furniture. Although you can find this brand through other websites, RecPro also sells and ships directly to the public from their own site. They make sofas, dinettes, tables, recliners, sectionals, ottomans, and more. One of their most interesting products is a recliner with powered assistance to help you stand up. This company specializes in making their own solid wood furniture, which is custom-built for each order and takes about 4 weeks to ship. Bradd and Hall make dining tables, desks, folding coffee tables, and wooden dinette booths. They also carry Flexsteel upholstered furniture, including Captain’s chairs and mattresses. You can buy directly from their website, their showroom, or authorized dealers. 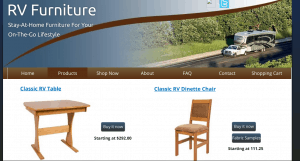 The RV Furniture Center has a showroom in Idaho where they offer installation, but they will also ship from their online store. Besides the normal upholstered furniture in the form of recliners, sofas, driver/passenger seats, and dinettes, they have memory foam mattresses in “short Queen” length (60″ x 75″). I find memory foam mattresses so much more comfortable than the typical RV mattress, so it’s nice to find a place that sells a memory foam mattress size that will fit an RV bed. This Florida-based furniture company has every type of upholstered furniture you typically see in an RV. They have separate sections for Captain’s Chairs for both Class As and Class Cs. They also sell recliners, sofas, dinettes, sectionals, ottomans, and wooden tables, plus some replacement parts. 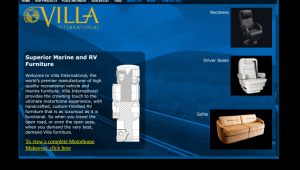 They carry major brands of RV furniture such as Flexsteel, Villa International, Lafer, Lambright, and Sunbrella. 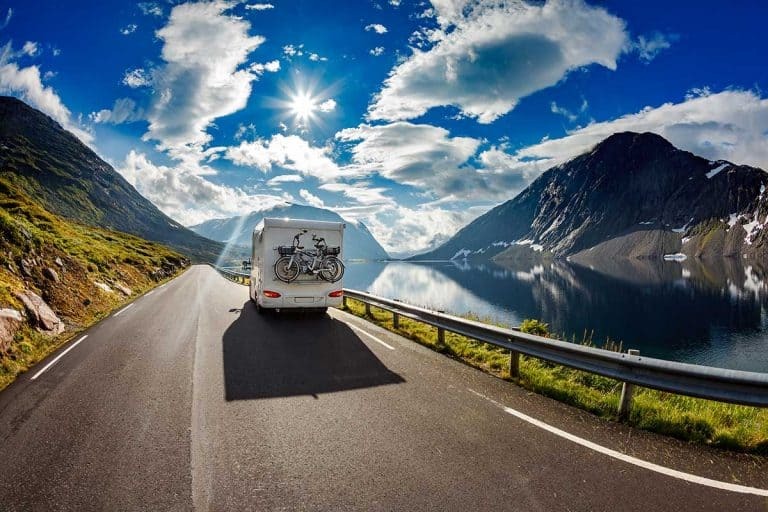 PPL is a Texas-based dealership that primarily sells all types of RVs (not just motorhomes), but they also sell and ship furniture. The catch is that it seems like what they carry is a random assortment of stuff; looking at their website, I found the furniture page a little disorganized. However, some of their prices seem pretty low compared to other websites, so you may find a good deal. Yes, you can find both new and used RV furniture on eBay. As with all eBay purchases, proceed with caution–not all sellers are alike as far as reliability and quality of products. Luckily, eBay is pretty good about protecting their buyers when it comes to issues. You also don’t have to do an auction; many sellers offer “Buy It Now” or “Make An Offer” options. Who knew etrailer.com sold RV furniture? I sure didn’t until I found them in the search results. They also have some parts and accessories. While there isn’t a huge selection, they do seem to have some competitive prices. I guess etrailer is not just for getting towing/related items and asking their expert staff for free advice. They state they have an average of 400 hours of product training on their products, so I would imagine this extends to their furniture section as well. I found the formatting to this website to be a little clunky, without a way to return to the previous page without using the back button. They also didn’t have anything extraordinarily different as far as furniture, with some categories empty, or only containing one or two items. 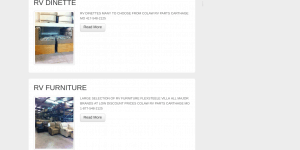 However, their front page for their furniture section is pretty good. They have a short video from their showroom that shows some furniture in action. They also have an informative section about things to consider as far as safety and insurance when buying new furniture for your RV. If nothing else, I recommend you check out that page. You can find products from this furniture manufacturer through other places, but when you order directly through their website, you have an additional, unique option to put in an order for custom furniture. This is a great option if you have a spot that won’t fit the standard furniture. This is a common occurrence as RV floor plans change and manufacturers go out of business or are bought out by others. Although they have “coach” in their name, many of the pieces they sell would certainly work in towable RVs also. They have some really impressive-looking sofa/dinette combos that are worth a look if those two items are right next to each other in your RV (as they often are). The pages had strange formatting on my browser, so if you have the same problem make sure to scroll way down to see the products. This company does not allow you to order online, because they want you to email or call them to ensure they get all the details correct. But they will ship to you and give a quote for shipping at the time of order. This Oregon RV furniture maker sells big names like Flexsteel, but also custom-makes wooden cabinets and other items themselves. They will re-upholster furniture at their showroom, or even sell you the raw materials to do the job yourself (or pay someone local to you). There are also options for used and consigned furniture that can be shipped. Furniture pulled from RVs that have been declared unfixable by insurance are often perfectly fine and sold at reasonable prices. A lot of these RVs have body damage but the interiors are intact, so there is nothing wrong with the furniture. Additionally, you can find rare items that new furniture sellers no longer carry. If you get an exact replacement from your year, make, and model of RV, you know it will fit right. The drawback is, you can only buy what they have on hand, and the selection can be hit or miss. They will ship, but you have to place an order over the phone. Even though they offer warranties on their products, I recommend you have the salesperson visually inspect the item before you agree to buy it. They might also be willing to send you additional pictures if you ask. It probably won’t be in perfect condition, but you do want them to verify whether there are any obvious defects before you have them ship a heavy, expensive piece of furniture to you. It might be worth a look. Although this company is not strictly an RV furniture manufacturer, some of the RV stores, like Camping World, do sell their products. You can also buy from them directly, and they will ship to you. Their selection includes recliners, living room chairs, and ottomans. 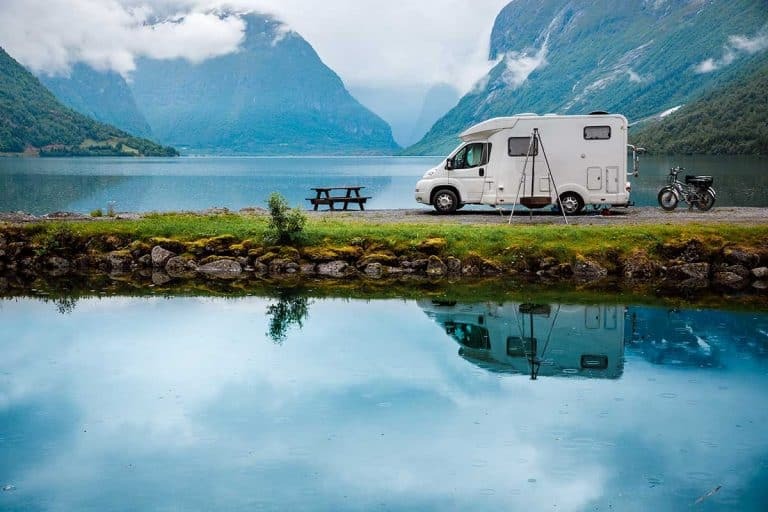 They might be a nice departure from the standard RV furniture, but be mindful that many pieces look like they would be difficult to bolt down for safety; they might be more like 5th wheel furniture than what’s meant for travel trailers or motorhomes. 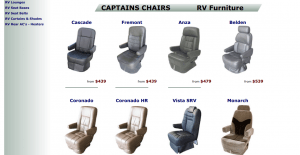 As you can imagine, this site sells all types of RV seating including Captain Chairs, recliners, sofas, and dinettes. They even have furniture packages, which are handy if you’re replacing all your RV seating and you want it all to match. They offer a lot of fabric and leather selections, upgrade options (like power recline), various sizes and even custom sizes. If you need replacement seats for truck, van, or SUV, they have that, too. Obviously, IKEA is not specifically RV furniture. But you’ll find it in a lot of RV, and tiny home remodels, for many reasons. Firstly, it’s affordable. 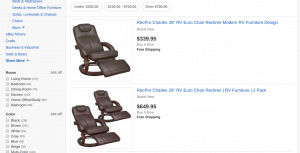 RV furniture can get expensive because it’s a specialty item. Second, it comes disassembled so it will fit through the door of your RV. If you try to bring a regular sofa or recliner into an RV, it’s likely not to fit through the standard RV doorway. Third, it tends to be lightweight. This can also be a downfall because IKEA’s construction might not hold up to a life on the road. Fourth, they have many options, including cabinets and other pieces that are narrower in width and depth than a lot of pre-built furniture. Lastly, they have a lot of convertible furniture, like cabinets with doors that convert to a tabletop. This company is based in Missouri. Like the Arizona salvage store, they offer a lot of the major brands. However, if you want to know w20hat they have, you’ll have to call or email them with a specific request. As with the other salvage place, I recommend asking for detailed pictures and also verification of dimensions. They will ship to you, but you will probably have to place the order over the phone. This website only sells outdoor furniture, which means it’s technically not just for RVs. 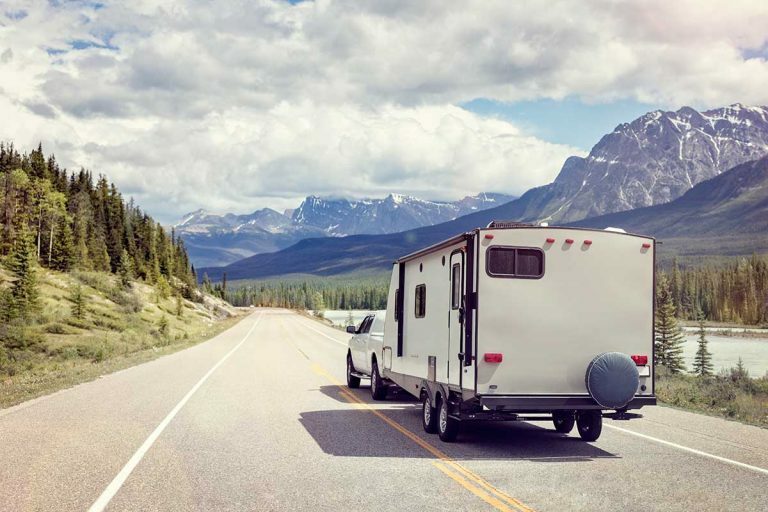 However, it looks like it all can be folded flat and is fairly lightweight, which means you can probably fit it in your RV’s basement storage compartments. Their chairs come in all styles, including recliners and ones that have attached trays for drinks or food. They also have a camp kitchen, folding tables, folding benches, and some inflatable loungers. If you’re in the Oregon area, this company will re-design and remodel your RV for you. If not, they sell Captain’s Chairs, sofas, and recliners, shipped to your door. They also have wooden RV furniture, like coffee tables, end tables, and dining chairs. You do have to call to order, but they have pictures of products on their website. At the time I viewed this website, they had a lot of products without any pictures on them. It’s kind of hard to know what you’re ordering online without photos, but perhaps they will fix this issue by the time you visit. They sell chairs and sofas, seemingly all from Lippert. Although the company is Canadian-based, they have warehouses in the U.S., which prevents border fees. This company makes their furniture right in the U.S., from the frame up. This gives you many customizable options in combinations you might not see in other manufacturers. They do all the usual: recliners, Captain’s Chairs, sofas, and dinettes. They also sell DOT-compliant seat bases so everything can be safely bolted in. Not to be confused with the RV Furniture Center (#5), RV Furniture is actually the name of an RV Furniture manufacturer. Their website says they’ve been in business for 20 years, and they’re in Kansas. They make solid wood tables and dining chairs in ash, oak, cherry, maple, and beech. There are several fabric options for upholstery on the chairs as well. This is another RV dealership that also has what they call a surplus parts store. They carry all the usual suspects: seating, dinettes, and tables. I also saw a few wooden bases for jackknife sofas. In stores, Walmart sells some RV supplies. 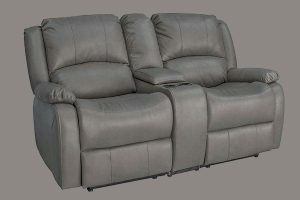 But online, they offer RV furniture from RecPro (sofas and recliners). 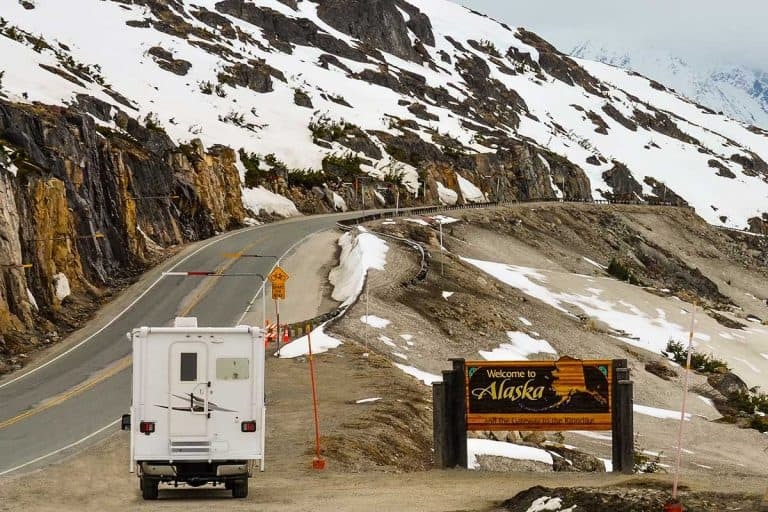 They also carry RV bunk mattresses and mattresses in shorter RV lengths. They have RV tables for both inside and outside the RV as well. Some items are shipped directly from the manufacturer while others come from Walmart; they can be shipped, or you can also get the free in-store pickup. 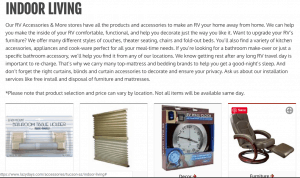 A lot of the websites mentioned above also have showrooms. But, there are also several stores that will not allow you to buy online or ship to you. 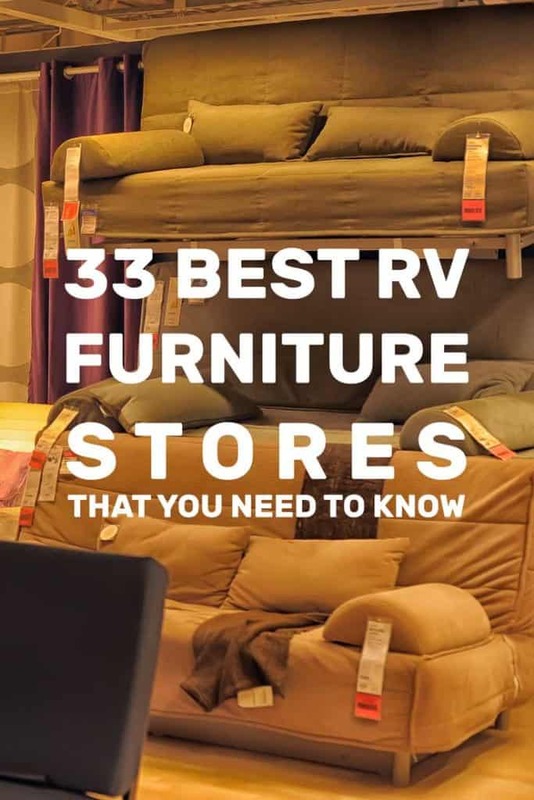 Here is the list that I found for both new and used RV furniture. Many dealerships also have parts and service department, and the ones with enough space will also carry furniture. The advantages of buying locally are the ability to try out each piece before you buy it, and not have to pay for shipping. Also, you can often have the service department remove your old furniture and install the new. This is a good idea especially if the piece is bolted down or attached to the wall because you want to make sure it’s safe and secure when you’re driving. I’ll name a few here, but you can also check your local listings for more. Keep in mind that might not have websites, and you might find the best deals there because they don’t have to cover advertising costs. Here’s an example of a search I did. This company is in Bradenton, Florida. They sell high-end RVs and other vehicles (even yachts!) and also have a service department. 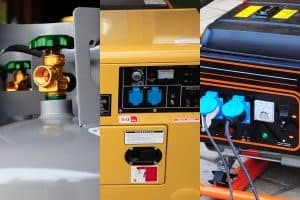 They do not have any pictures of furniture for sale on their website, but according to a blog post, they do sell and install RV furniture in all types of RVs. This dealership, rental company, and service center sells furniture out of their showrooms. They are located in Tucson, AZ, Loveland, CO, Denver, CO, Minneapolis, MN, Knoxville, TN, and Tampa, FL. They even have an RV resort in Tampa. You can see some of their furniture online–you have to go by location, but I believe they can transfer items from one store to another. This Concord, NC RV seller does full remodeling. They even have a custom cabinetry shop for any special sizes or shapes you might need. They can also reupholster existing furniture. Located in Riverside, CA, Recovery Room sells new furniture and refurbishes existing pieces. They offer installation as well. Other services include replacing window blinds and flooring. You can find some deals on your local Craigslist for RV furniture, although it will most likely be used and selection will be limited. Craigslist can also be a pain to work with sometimes because you have to sift through scammers and flaky people who post ads and then don’t respond.Also, make sure to check the free section. I know a couple remodeled their RV. They gave away a used motorhome sofabed and dinette for free to the first person who was willing to come in with their own tools, unbolt it from the floor, and carry it out of the RV by themselves. Here’s just an example from a search around Los Angeles for “RV furniture”. 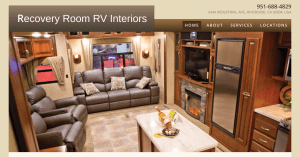 Amazing Creations in Junction City, OR is an interior RV design and remodeling company that sells furniture. They will also install furniture bought either through them or elsewhere. Other services include custom cabinetry, window treatments, flooring, appliance and electronics, and refinishing. Whew! That was quite the list. I’m sure you could find more if you tried, too, just by asking other RVers you meet. Happy shopping! 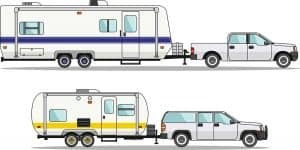 SUV vs Pickup Truck for RV towing: which to choose?